The Slandy Report » Brother, Can You Spare a Gallon of Gas? Brother, Can You Spare a Gallon of Gas? Gas is over $4!! The sky is falling, the sky is falling!! People are hurting, they can’t afford the gas to get to work. We all know that gas prices have increased about 40% in the last year, according to AAA. Oil is at a record, too. Why? Is it the evil “speculators” that I keep hearing about? Nope. Evidence and logic suggest that this is not an issue. Is is global warming? Nope. The answer, as it is for most pricing questions, is supply and demand. Despite the sluggish US economy, the world economy has been doing quite well, thank you. Several years ago, nobody really invested in production capacity for the raw materials required to sustain a booming China and India. The resulting shortage is why many raw material prices have increased so much in the last few years – including oil. Now, for a little perspective. As mentioned above, the average gallon of regular unleaded in the US has increased from $2.96 to $4.11 in the last year, or about 40%. Not to minimize the terrible strain this has placed on most of us, but please take a look at the chart below. 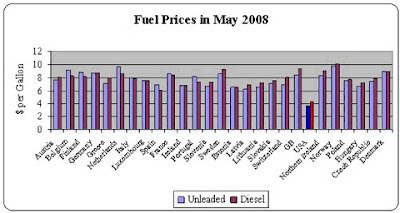 It shows 26 European countries’ prices vs. the US. If you’re having trouble reading the names, just look for the lowest bars – that’s the US. These prices are from May (before they hit $4 average), but the graph would look the same today. $4 is expensive, but every one of these countries were over $6, and 12 of 26 were at $8 or more – more than double the US price! It’s not much better for our friends north of the border (south of the border if you live in Detroit). According to ontariogasprices.com, the price of regular unleaded in Ontario ranges from about $4.88 – $5.61 per gallon after adjusting for exchange and metric. I know none of this make it any easier to fork over the $60 – $80 to fill up your tank, but just be happy you don’t live in Europe or Canada!